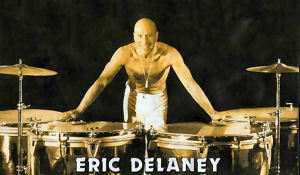 I arranged to meet Eric Delaney at Tom’s Drums in Denmark Street and believe it or not the great man was early while I turned up fashionably late. 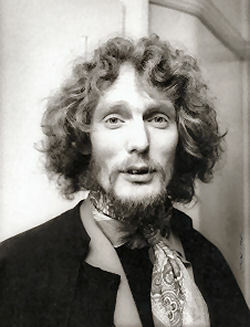 In the fifties it was Eric who turned me and arguably every other drummer of my generation on to the possibilities of playing the drums. 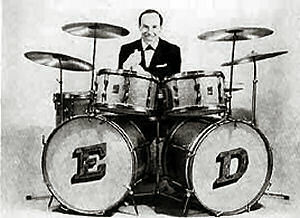 He was the premier showman drummer of the time (pun intended) and if anyone was playing a flamboyant drum solo on black and white TV in the late Fifties it was always Eric. 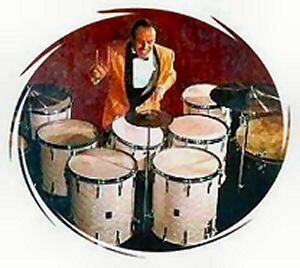 He was often on 6.5 Special and to make things even better for us pimply teenagers he always played not one, but two bass drums with a pair of same-sized small toms (like Louie Bellson’s) mounted between them (these the internet informed me turned out to be regular snare drums without wires). He was invariably surrounded by percussion instruments and absolutely the epitome of fifties cool. 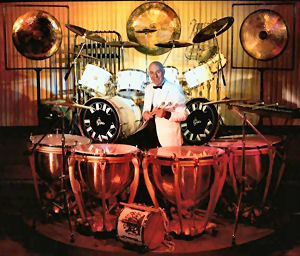 I met him when he was just 84 years old and just when he’d appeared conspicuously in Rhythm Magazine’s Top 100 Drummers chart – although nobody seemed to have bothered to tell him about his achievement. At twenty years his junior I really thought I should call him Mister Delaney! As usual I started from the beginning. What actually got you into drumming Eric? 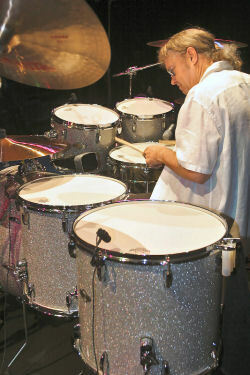 “I started playing the drum when I was 18 months old. My mum bought a drum for sixpence (2.5p) from Woolworths. It appears when I was 8 I earned money playing as a little guest drummer at local hotels that mum and dad had arranged for me to play at. I can’t remember that, but I got the publicity in the local paper, so I know it happened. Dad was keen to keep it going. We went to one of the jazz clubs that was going in those days and Ray Ellington was appearing, he went up to my dad as I was playing (because I was the youngest boy there) and he said “He’s going to be alright”. From that developed lessons with Max Abrahams and here I am. So what year did you go to Max, are we talking 40s here? “Long before that. I left school when I was 13, Hughie Green and I left school together. We both got a bollocking because in those days you weren’t supposed to leave until you were 14. His dad put a show on (I’ve still got the poster) where I’m playing with two lady accordionists and I’m billed as ‘Britain’s Youngest Swing Drummer’. From then on, I’ve been in show business all the time. I did two of those Hughie Green shows. So Hughie was a friend? “Yes. Then I went to one of the Seymour Shows. The idea was that when you were in a band, (whatever band it was) you tried to make it to Sid Seymour who had a band. Then from those shows I think I went to Jimmy Honeyman’s Band at Streatham. The war had started then because we had to do air-raid duty -we had to sit on top of the Palace all night. They used to give us cups of tea and we took it in turns. I’ve worked out you were about 15 at the start of the war so fortunately too young to enlist? “Yes, much too young. 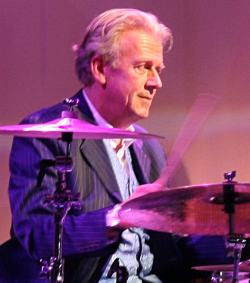 I went up to Morecambe to Norman Robertson’s Band and whilst I was there I read an advert in the paper – Musicians Wanted: Drummers. Would you believe that was for the Ambrose Octet which at the time was led by the trumpet player Kenny Foster and piano player George Shearing. He’s Sir George now of course. He fell over the other week for the first time – he’s alright but it put the wind up him. So you were born in London? “Yes. Acton, May 22nd 1924. What year would we be in when you joined the Ambrose Orchestra? “1939 or 40. When did the war start? “Definitely then, because George [who was blind] used to take me home, I lived with him at the time, when he was married. We were doing Brixton Empress with the train line upstairs, and of course it was during the blackout, so we had no indication what train was coming – just this light for the driver that was all we saw. Anyway the train came along and George got hold of my arm and pulled me back. It’s not this one, it’s the next one. How the hell did he know that? “The war came along, that’s when I actually was called up. My dad was in the Air Force, he’d been in the first war as well. Now he was a squadron leader and at the time he was stationed at one of the big stations in London and he said ‘If you go on a Morse code course and you’re any good I can demand that you come to my squadron so then you’ll be in London and be able to keep on playing’. So I went to Blackpool to ‘Number 4 Radio School’ to train and Norrie Paramour [who went on to become a famous A&R man at EMI records and produced Cliff and The Shadows and Helen Shapiro among many others] was running a band up there. Somehow or other he got to know I was there, so I joined the band but only for a few week because he advised that if I wanted to keep playing in the Air Force I should become anything other than a tradesman. So I became a ‘shithouse wallah’ which was good because I’d finish work at 4 p.m, so I could go home, have a shower and then I was free to go out and play at night. “Yes, we used to work at the Empress Ballroom which is still there with all the original décor and everything. In fact I’m there soon for three days over a weekend. In this time, what drums were you playing? Anything during the war, whatever was there. So when would you say you actually got involved with a drum kit endorsement, was that much later? Yes. The first lot were Boosey and Hawkes because Sam Norton was the man there at the time and he used to bug everybody to play his stuff, which guys like me and Jack Parnell did of course. This was Ajax. I didn’t have that set for 5 minutes and somehow or other Premier came on the scene by way of Fred and Clifford [Della Porta]. I read somewhere that you once had a Leedy kit. “No, I never had a Leedy kit. The only American kit I had was not too long ago, was Gretsch. The Gretsch importers came to one of the gigs we did. It was in the dressing room and the boys were listening to what was going on: “Go on Eric, do what they want, change”. Did you play Premier before that? “Yeah, of course, Premier. So I did change and it didn’t last 5 minutes because the band had to help with the drums because we all travelled together in my bloody great lorry and they turned around and said ‘Its crap this stuff’. All the fittings were breaking and that prompted me to say when I went back to Premier ‘The reason I’m coming back is you’ve got British steel which is best in the world, British chrome-plating which is the best and British craftsmanship’. So what are you playing now? “No. 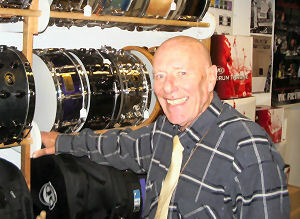 The bass drums I’ve got which I’ve had for years are made by Alan Gilby who is Richmo. I’ve put the Premier logo on the bass drum. Let me drag you back to the past. I don’t believe we’ve got to the 50s yet. Is your war over? “No. Whilst at Blackpool I got posted to India, we arrived at Bombay in a big convoy – frightening. The pictures you see on television are all miserable and that’s just how it was, ships everywhere. Of course the submarines were attacking us. Anyway, we arrived at Bombay, so much for that. I went into the cookhouse and there’s a notice: ‘Artists and Musicians wanted’, for another road-show. So I applied and 10 minutes later I’m posted to Ceylon which is now Sri Lanka, there was a 6 piece band and the pianist was Alan Roper, the trumpet player was Russ Nicholson, both were [eventually] in my Big Band. We put the band together just after the war had finished when we were standing in Archer Street [looking for work] with Ronnie Horner who kept in touch with Russ Nicholson who had now gone back up north. Ronnie said shall we go for a drink. So we went in the pub and he said “come on then, this band of yours, what’s it all about, who’s in it? I said “well you are for a start, shall we have Russ Nicholson as well”. And that’s how it began. We’re still not in the 50s? I started crying, I couldn’t believe it. I phoned my mum up and told her, I knew the programme was on at 1 o’clock, I said “Put the radio on”. The next day I get a phone call, I went up to Geraldo’s office in New Bond Street and the secretary told me, Geraldo was in America, but he’d be coming back soon. I think it was only a couple of weeks later that I got called into the office. And the gig was yours! How much was it worth? “£3 – I’ve still got the letter, it’s in my press cuttings. Of course this is all relative but how much were people earning when you were getting £3? I’m assuming that was very serious money compared with what other people were getting then. “In 1947 we did Blackpool for the whole summer season and we used to go with our cheques into the bank. We not only got paid for the week, we got paid for every broadcast, we earned so much money, unbelievable. And you put it all away, right, just like every other drummer? “Yeah, and I’ve got f**k all at this moment, spent every penny! And you don’t regret it? So during the 50s with the Eric Delaney Big Band you specialised in Variety shows? So every week a different place to go? “Yeah. We did so much work. Were you topping bills then? So all through the 50s you did weeks in theatres? “Yeah [but before that] Cyril Stapleton and the BBC Band offered me work, I’ve still got that letter too. Then I did the Squadronnaires. I met up with the ‘Squads’ with Jock Cummins [on drums]. He was peed-off with touring and I was peed-off being in the studio – I wanted to get amongst the people! Jock said: “We’ll swap”. We decided on the change and at the time the Squads were rehearing in Dineley’s Studio. When the band finished Tommy McQuater came up to me. This is the audition: “We know you can play, let’s go to the pub and see how much beer you can drink” and that was my audition with The Squadronaires. “Not a lot. But it was their way of saying we can’t audition you, you can play, we know that. That lasted 6 months, I went back with Geraldo but now I’d experienced the audience reaction outside the studio. Were you reading all the time then? “Yes, I think that’s why I did so much work in film studios. The first person we got in was a wonderful alto player from Belgium, wonderful, just as a guest in the studio. The next one was Thelonious Monk, who could just about speak English – he was as high as a kite. Did Monk swing though, was he great to play with? “He didn’t play, he did the odd chord, it was a joke. The next guest was Bill Finnegan. Well then, of course I was over the moon about that because he had just come from the Dorsey’s band which was the two of them, Jimmy and Tommy and the drummer was Louie Bellson. So I thought right all the parts are going to be here, double bass drum and all that but there was nothing. It was all Louie’s ideas. When did you start playing double bass drums? “I don’t know I can’t remember. Very early on. Before Louie do you reckon? “No, I got the idea from Louie. What date do you reckon we’re up to now, the 60s? “We were in Glasgow at the time and we were top of the bill at The Empire. Down the road in a few days time was this Bill Haley and the Comets, and people were sleeping on the pavement round by our theatre to get tickets. Of course we knew what had happened and I turned around to the boys the next week in the band and said: “I think this is it fellas” and it was then that I started getting ideas about a small band. Then I bought an organ from Jennings a huge big thing, and I used to look at it and think well we’re only using that much of it, the thickness of the keyboard, cut that bit out – hence the box organ. Now, what were we talking about? Well we were talking about the impact of roll n roll, you reckon it was overnight? After all your Royal Command Performances, prestigious gigs and playing with the most famous people of the era you were going to talk about one of the few auditions you’ve ever done. “I was asked to do something last year on a television show ‘Britain’s Got Talent’ a friend of mine put in for it. I didn’t want to do it and eventually the word gets back and the television people phoned me on a Sunday. It was a lady: “Mr. Delaney I believe you don’t want to do it”, “No I don’t want to thank you all the same, very nice of you to ask me (and all that)”. She said: “If you win we’ll take the show on the road you know”. I said “Yes I know and I know where you’re going to go and I’ve done it all”, she knew nothing. She said “It’s a shame you won’t do it, it’s only a bit of fun you know”. 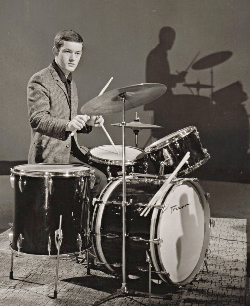 When you were growing up, when you first got to drums, who were the guys who you thought “Blimey he’s good”? Were you hearing American drummers from the start? “Oh yeah that was years ago, people like Jo Jones, Big Sid Catlett, I loved him, Ray Bauduc, Sonny Greer, all those sort of people. Obviously Gene Krupa was around too. Did he have more influence on you than the other guys? 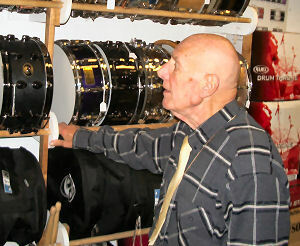 “Yes, we go back to my teacher Max Abrahams, he brought me the Krupa Drum Method book which is still available with all the circles on the front, that’s how you can see it and of course at the back he had all the parts written out that he played including ‘Sing Sing Sing’. There’s a lovely story about Buddy Rich. Derek Cox, who’s a piano player, did an arrangement of ‘Lime House Blues’, he took it along to Buddy’s band who I think were at Ronnie’s rehearsing – “No, don’t like that”. The next occasion that Derek Cox arrives with this arrangement was for Louie’s band. He goes up and said ‘I did this for Buddy and Buddy didn’t like it’, so Louie turned around and said ‘Well I don’t wonder how because he can’t read music anyway’, so that was the end of that arrangement for Buddy. But how could you write a Buddy Rich drum part? I’m assuming that he changed the part all the time anyway? “Of course, yeah. That was the big thing about him. Lovely man, I was at his 60th Birthday party at the Dorchester Hotel, he was sitting on the floor and in comes his cake which I think Derek Bolton had got for him, he took the band off the cake and put it around his head, sitting there like a little boy, lovely. I’ve got loads of pictures of us sitting, talking. So the 60s reared its ugly head and you did the small group. Did you then think about embracing rock ‘n’ roll, or perhaps give a slight nod in that direction? Did you ever straighten out your 8s (if that’s the phrase for it) sort of play in a more rock n roll style? (Laughs) “I don’t think I did, did I? I don’t know, because with most of the sixties music you couldn’t play ‘10 to 2’ against it, it needed to be straight 8s. “There’s very few pieces of music that we played with anything like an 8ths feel. We did record a couple of things like them for EMI with Sir George Martin, who ran the Beatles. He loved us fortunately, he was very nice. He let us do a couple of things with that suggestion of 8ths, as you say. Didn’t work, not for me, and fortunately we didn’t have to play it. Wherever we went I always did my own stuff. So you eventually went to Spain? “I went for 3 months and stayed 11 years! 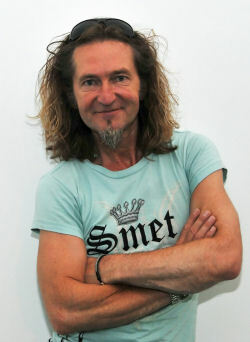 It happened that my keyboard player that I had all during the eighties at The Tower Ballroom Blackpool, left the band. Out of the blue I get a phone call from Spain and it was this keyboard player saying “We need an act after George Roper, the comedian. He goes on stage midnight until 1 a.m. and then at 1 o’clock we want a good act, and you’re the one to do it”. I said “I’ve got so much work here, at the time and I had contracts for it so that was that. The second year I get about two or three phone calls, third year now I’m thinking more about it and I wasn’t doing so much work. In the fourth year I got continual phone calls including some from the governor of this place, I said I’d go for 3 months and that lasted 10 years. Were you playing in the same place? “Yes, the same place all the time, Benidorm. Set up was lovely. The club was called The Town. During my stay there two comedians we had worked there had died, the last one of course was George Roper. I’m going to ask you about gear in a minute. Of the youngsters who do you think has really got it. Who do you admire out of the modern guys? “To be quite honest I don’t know their names but there are so many. 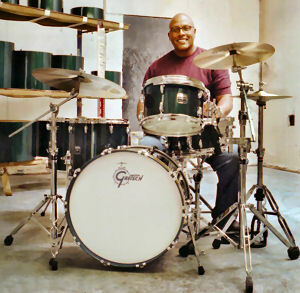 I love Billy Cobham, he plays today’s sound but look how old he is. He’s coming up to 65! Would you say then that guys are better these days, I know that’s a huge sweeping statement? “Unfortunately they are, yeah. And how the hell they’ve learnt it, I don’t know. I think I do. By listening to people like you because it’s much easier to hear (and see) people these days and copy them. Music’s more accessible. I mean we were just on the internet and we were studying Tubby Hayes from 1969 on YouTube. You couldn’t easily do that even five years ago. “And of course we didn’t even have television in those days. You struggled to learn it from 78 rpm records and had to assume how they did it. And you could get it wrong. It was the same with us sixties rockers. We listened to it and never thought how they were doing it. We just did it and often got it wrong. Certain things like paradiddles we had no idea about, we didn’t work out why we needed them for years. “Well look at Dave Tough’s book, only on paradiddles, wonderful. Well it don’t mean a thing today. So as far as your kits concerned, tell us what you’ve got. Not the same size anymore? “No. I don’t know what size they are, and then two floor toms, about 16” I think, one either side, that’s purely for a show. I realise Buddy had two, God bless him. So all of that stuff’s from Premier? “Yeah. The boys in the band christened it the Christmas tree, because I tried to have one little tiny cymbal that Gene Krupa used to use, I liked that little one, just for tricks, the boys always called it a Christmas Tree. But amongst all the gadgets I made it so that I could have three out of one stand which goes in the centre of the two bass drums and then two cymbal stands, one either side, plus a hi-hat and that’s it. Are you still carting the Timps around? “Yeah, four Premier timps. I’ve got two lots now. I bought a lot when I was in Spain. I could see this work was coming up. “Would you believe Yamaha? Bloody good too, metal. Have you still got the Premier Marching Drum and are you still doing that in your show? “Yes, the Royal Scot and since then I’ve added an Andante, that’s a buster to play because it’s so high. I don’t know how these pipe drum players play but they’re good at it. I think that’s it for the moment Eric, it’s been a privilege. Thanks for coming.